The trip was awesome, one of the must do before death kind of visit. 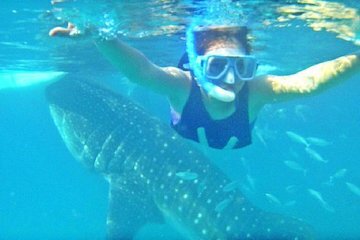 Swimming with a fish the size of a bus, opening its mouth toward you, is not a experience word can describe. A couple things you should watch for where the info didn't mentioned. 2 There is no locker or secure spot you can store anything. The boat you are going to broad is tiny, you only have space for yourself, so hire a driver and store your belonging in the car. 3 You are not allowed to put on sun block. they would ask you to wash it off if you put it on before you arrived, they said they would send you to jail for 6 months if you violate that. and it's anyone's guess how to wash yourself up when they could run out of running water. 4 The washroom has only one slot for man and 2 slots for woman, it was usable clean when I was there, but I had to wait 20 minutes for it. 5 GET A WATERPROOF CAMERA, make sure you have float for your camera I did see people losing phone they put in water proof bag, since you will be doing a lot of chasing the shark. you don't want to miss the video/photo or worse drop your camera. 6 After you get onto the boat, you will get out side and the boat rower will get into a queue of boat. there's will be feeder boat leading the whale shark along the line. so you are guarantee to see every shark, just get into the water as soon as you can and be ready with your camera. 7 The spot is not very far from land, so if you are good with swimming, drop the life jacket and swim. but staying beside the boat would still be great, just don't stay in the boat, you would be seeing only the tips of the iceberg looking for above water.